Head over to Market Square Park, one of the origin points of the remerging Downtown, for a gander at the visually electric Houston is Inspired mural at the corner of Travis and Preston. If you rarely get to Market Square Park or the Historic Downtown District, you may have missed the most technicolor display to happen in Downtown in years. 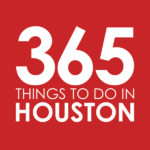 The mural was created by Gonzo247, artist and founder of Houston’s Aerosol Warfare Studio, on a commission from the Greater Houston Convention and Visitors Bureau (GHCVB) with the assistance of the Houston Arts Alliance. Houston Is Inspired dominates the south side of Treebeard’s Restaurant, situated across the street from Market Square Park. Completed in April 2013, Houston Is Inspired was officially unveiled in a ceremony on May 7, 2013. This new Houston downtown mural was the local centerpiece of the GHCVB’s successful and well-received “Houston is Inspired” promotional campaign, which highlights our culinary and arts scene and the people who comprise it in The New York Times, The Wall Street Journal and elsewhere. The Houston Downtown mural itself features a stylizes Houston skyline, including a bright blue Downtown Aquarium ferris wheel, with a wild, diverse and largely symmetrical patterns of color streaming from behind it. 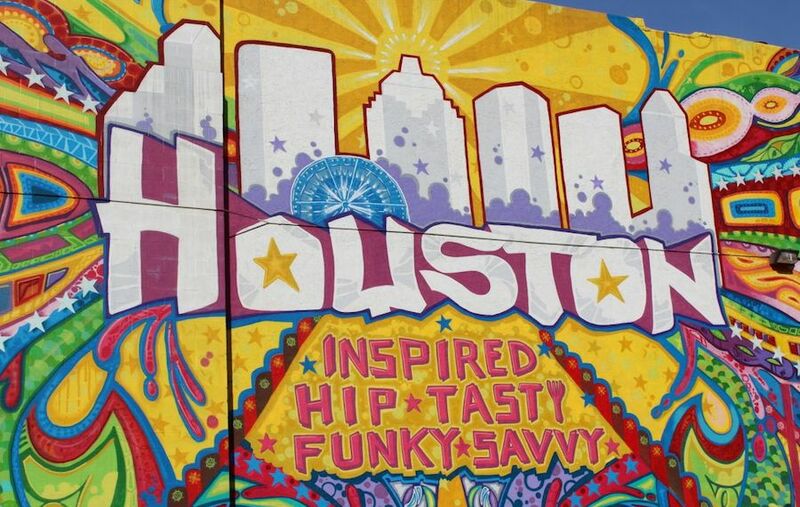 The skyline emerges from the city’s name, which itself rests above the descriptive words “inspired,” “hip,” “tasty,” “funky” and “savvy.” True to the form and intent of the “Houston is Inspired” campaign, Gonzo247’s word choices built on the choses theme of arts and food, while adding his own take and spin to them. Gonzo247, who also answers to his given name Mario E. Figueroa, Jr., told the GHCVB that the design depicted a city coming into its own, like a butterfly emerging from a cocoon and displaying the strength of its diversity and variety. The words themselves represent the the characteristics upon which Houston’s growing popularity and emergence is built. Parking: Conveniently, the mural sits above a pay parking lot itself, so most of the time you can likely find a spot right there below it. Just be prepared to pay. However, you can likely also find a metered spot along the street or in other paid lots in the neighborhood. Creator: GONZO247, the nom de can for Mario E. Figueroa, Jr., founder of Aersol Warfare Gallery.